Located in Falmouth, this beachfront property is next to a golf course, 1.6 mi (2.5 km) from Luminous Lagoon, and within 12 mi (20 km) of Rose Hall Great House and Greenwood Great House. Cinnamon Hill Golf Course and White Witch of Rose Hall Golf Course are also within 16 mi (25 km). This Falmouth property is on the beach, 1.6 mi (2.5 km) from Luminous Lagoon, and within 12 mi (20 km) of Rose Hall Great House and Greenwood Great House. Cinnamon Hill Golf Course and White Witch of Rose Hall Golf Course are also within 16 mi (25 km). This Falmouth property is on the beach, 0.7 mi (1.2 km) from Luminous Lagoon, and within 12 mi (20 km) of Rose Hall Great House and Greenwood Great House. Cinnamon Hill Golf Course and White Witch of Rose Hall Golf Course are also within 16 mi (25 km). How Much is a Hotel Room in Falmouth? 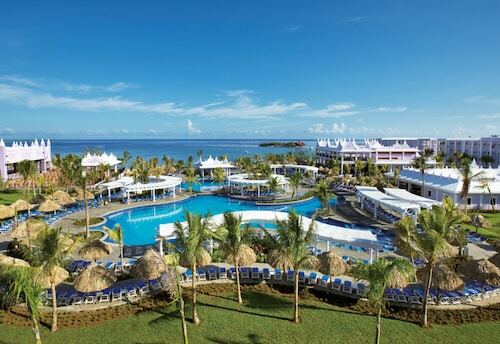 Hotels in Falmouth start at $213 per night. Prices and availability subject to change. Additional terms may apply. For those adventurers who are hoping to find a place to base their adventures close to the hustle and bustle of Falmouth, Travelocity lists several options. 6 lodgings listed on Travelocity are situated within 6-mile (10-kilometer) of the city center. Securing a place close to the action of Falmouth has never taken so little time. Our comprehensive guide covers the Fisherman's Inn and Glistening Waters Hotel, which can be found within a distance of 0.6 miles (1 kilometer) of Falmouth's downtown area. Travelocity's hotel database has just a few economical accommodation options in Falmouth. The Retreat Guesthouse Luxury Suites is one of them. The Half Moon Royal Villas is about 13 miles (22 kilometers) from the town center of Falmouth. 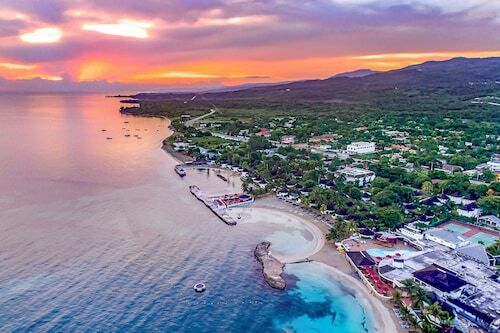 If you would prefer another option, the Sandals Royal Caribbean & Private Island All Inclusive is positioned 16 miles (26 kilometers) away. 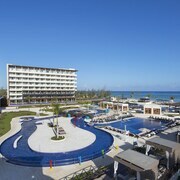 Other hotel options are the Half Moon and the Iberostar Grand Hotel Rose Hall All Inclusive. 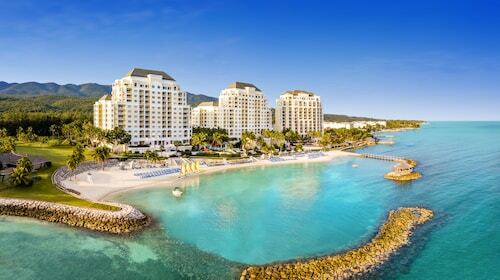 Ocho Rios is 35 miles (55 kilometers) east of Falmouth and boasts Dunn's River Falls and Turtle Beach. 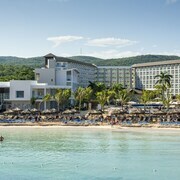 If you want to spend a few nights in Ocho Rios, check out the Sandals Royal Plantation All Inclusive and Hermosa Cove Villa Resort and Suites. 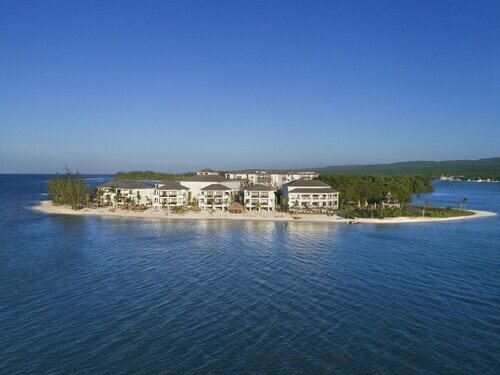 For another option, head to Rose Hall, 13 miles (21 kilometers) to the west of Falmouth, where you'll find the Hilton Rose Hall Resort and Spa - All Inclusive and Coyaba Beach Resort & Club. If you're staying in Rose Hall, be sure to visit the Blue Diamond Shopping Centre and Whitter Village. 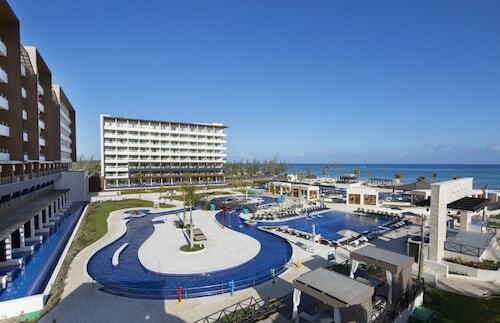 Prior to departing from Montego Bay, be sure you join the locals watching an exciting game of sport. Swing by Jarret Park, found west of Falmouth. 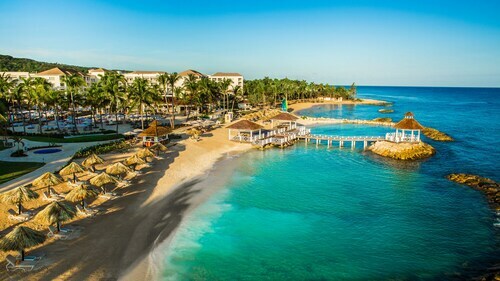 Find a Travelocity-listed room right by the sporting action at the Secrets Wild Orchid Montego Bay - Luxury All Inclusive or the Sandals Montego Bay - All Inclusive. Sir Donald Sangster International Airport is a primary airport for those flying in and out of Falmouth. You can find it 18 miles (30 kilometers) away. 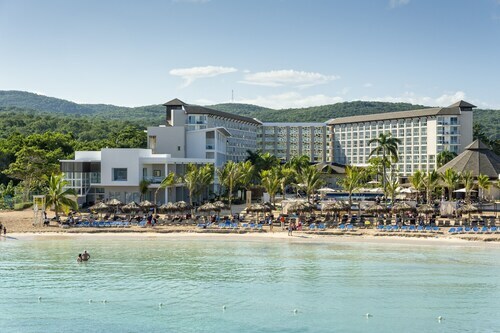 For travelers who plan to find accommodation nearby, have a look at Secrets St. James Montego Bay - Luxury All Inclusive or The Oasis at Sunset - All Inclusive. The property is absolutely beautiful. Incredible landscaping with paths throughout leading you in several directions at every turn. 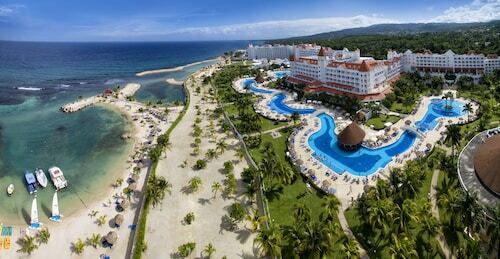 The staff was the best I have come across in any resort, this was our 5th all inclusive. Jevar and Marvin were our butlers for the week and were just great. They left us a surprise in our room several nights, champagne, cheese dish, fruit dish and thoughtful notes. They tracked us down every day just to make sure we were having a good time. Best time was at the water sports, sailing and kayaking. Andrew ran a great staff. Had the best time with Kemar and Byron. Very friendly and fun. Maxine at the pool bar was always smiling and happy. She always made my day. Drinks were top shelf and very good. The steak house and Italian restaurant were the best I have had. Ned and Peter at the steakhouse were the best waiters in any restaurant that I have ever eaten in. Only slightly negative thing I could say is that the night entertainment needs improvement. Would like more upbeat Jamaican music and some sort of beach party. We stayed at the Jewel at Dunns River Falls and the entertainment there couldn't be beat. Also would like the 2 small hot tubs to be working and actually heated. All in all this was the most beautiful resort I have stayed in. This past weekend, my boyfriend and I stayed at the Excellence Resort for my 30th birthday. From the second we walked up to the entrance, we were welcomed with warm towels and champagne. It immediately started our vacation on a good note. Our room was beautiful, food was amazing, the resort was extremely clean, with staff and constantly working on the beach and resort to keep things clean. The staff was exceptional!!! They always went out of their way to meet our needs and just to see how we were in general. This has been our favorite resort so far, and the views are endless no matter what end of the resort you’re on or what room you chose! Also, when we checked out, they still offered us to use our all inclusive while waiting to be picked up to head back to the airport! We will definitely be back here!! Our experience was exceptional! Resort was amazing. We loved the stay and we are happy with all amenities. The only issue I faced is even though there are 2 ala carte restaurants but we didn’t get access to it as they told that we need prior reservation that was not mentioned any where so end up eating all meals in a buffet restaurant which I felt bad because I spent that much money and went there and by hearing that I got disappointed. This issue might be small for many people but it’s big for me as I spent more money for this resort by just seeing 3 restaurants but finally it’s 1 restaurant actually. Disappointed with no coffee maker in room and no room service. Also disappointed that we had to fight to have a plate of food in the room when one of us was to sick to go down to dinner. The ‘no food in room ‘ policy is sticky enforced however, feel free to sit under the ‘no smoking ‘ sign and smoke as that policy is not enforced at all. The staff was delightful and very good. The beach was beautiful but swimming areas covered in sea grass. Pool was beautiful. Overall good vacation but would not stay at this particular RIU again. 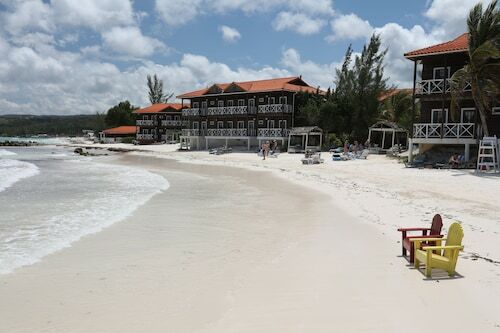 Paradise In The North Of Jamaica ~ Includes Your Own Staff!